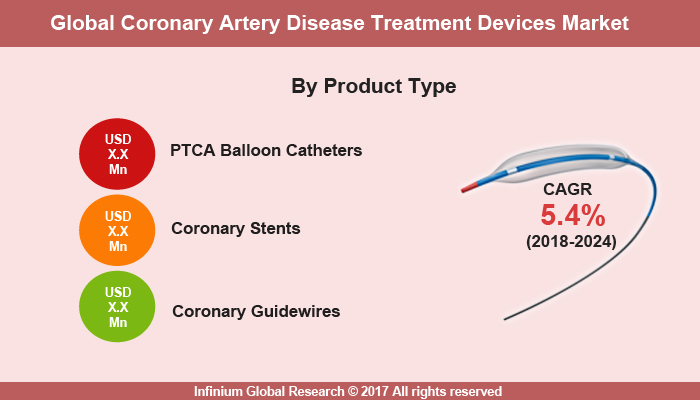 A recent report published by Infinium Global Research on coronary artery disease treatment devices market provides in-depth analysis of segments and sub-segments in global as well as regional coronary artery disease treatment devices market. The study also highlights the impact of drivers, restraints and macro indicators on the global and regional coronary artery disease treatment devices market over the short term as well as long term. The report is a comprehensive presentation of trends, forecast and dollar values of global coronary artery disease treatment devices market. According to the report the global coronary artery disease treatment devices market is projected to grow at a CAGR of 5.45% over the forecast period of 2018-2024. The thickening and narrowing of the coronary arteries disturb the flow of oxygen and nutrients to the heart, these vessels bring blood to the heart. The chest pain or discomfort in the shoulder, back, arm, neck, or jaw are a common symptom of coronary artery disease. The percutaneous transluminal coronary angioplasty (PTCA) balloon catheters, coronary stents, and coronary guidewires are the product types of coronary artery disease treatment devices. The percutaneous transluminal coronary angioplasty (PTCA) is a minimally invasive process in which a long, thin tube called a catheter is inserted into the coronary arteries that helps blood to flow free to the heart muscle. The catheter has a small balloon on its tip, the balloon expands at the blockage site in the artery to flatten or compress the plaque against the artery wall. The coronary stents, acts as a support or framework, to keep the vessel open and to increase the blood flow and reduce the pain of angina. Coronary stents are commonly used for treating coronary disease. Balloon catheters and guidewires act as secondary devices for the treatment of coronary artery disease. The high incidence of cardiovascular diseases (CVDs) and the growing geriatric population is driving the growth of this market. Moreover, the change in lifestyle and increased psychosocial stress leads to coronary artery disease, thus the demand for coronary artery disease treatment devices has increased significantly. On the other hand, the cost of devices is high, that is hampering the growth of the market. Furthermore, leading manufacturers focusing on the development of technologically advanced devices can bring new opportunities to the market. North America dominates the coronary artery disease treatment devices market, followed by Europe. North America accounted for the highest market share in 2017 on rising geriatric population having cardiovascular and diabetes disease. In addition, countries like U.S and Canada has developed healthcare infrastructure and improved reimbursement policies. These factors to fuel market growth. Asia-Pacific region is the fastest growing region on account of developing healthcare infrastructure in emerging economies such as China and India and rising disposable income in this region will boost the growth in this region. The Merger and acquisition, new product launch and technology advancement are the key strategy of the leading player to maintain their position in the world market. The majority of the market share is covered by the leading player. The Abbott Vascular offers XIENCE Family of stents device that is used to treat coronary artery disease. The report on global coronary artery disease treatment devices market covers segments such as product type. On the basis of product type the global coronary artery disease treatment devices market is categorized into PTCA balloon catheters, coronary stents, and coronary guidewires. The report provides profiles of the companies in the global coronary artery disease treatment devices market such as, B. Braun Melsungen, Medtronic plc, Abbott Vascular, Boston Scientific, Terumo, Cook Group, Biotronik SE & Co. KG, C. R. Bard, Inc, MicroPort Scientific Corporation and Others. The report provides deep insights on demand forecasts, market trends and micro and macro indicators. In addition, this report provides insights on the factors that are driving and restraining the global coronary artery disease treatment devices market. Moreover, IGR-Growth Matrix analysis given in the report brings an insight on the investment areas that existing or new market players can consider. The report provides insights into the market using analytical tools such as Porter's five forces analysis and DRO analysis of coronary artery disease treatment devices market. Moreover, the study highlights current market trends and provides forecast from 2018-2024. We also have highlighted future trends in the coronary artery disease treatment devices market that will impact the demand during the forecast period. Moreover, the competitive analysis given in each regional market brings an insight on the market share of the leading players. This report will help manufacturers, suppliers and distributors of the coronary artery disease treatment devices market to understand the present and future trends in this market and formulate their strategies accordingly.